Our journey takes us north from Tokyo to a landscape rich in spirituality and tradition. 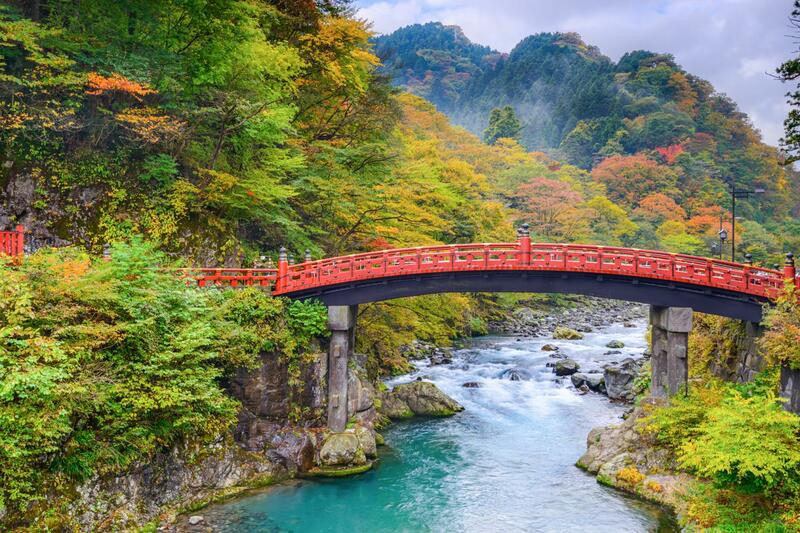 Though off the established tourist circuit, the sights of northern Japan rival anywhere in the country in their beauty and atmospheric grandeur. 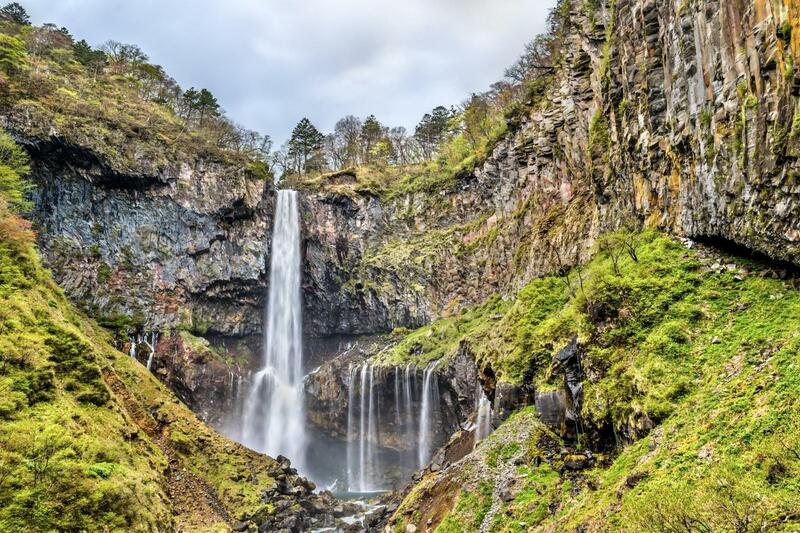 We visit both the better-known, magnificent destinations, such as the UNESCO World Heritage site of Toshogu shrine at Nikko and Dewa Sanzan, as well as the region’s more remote hot springs and beautiful national parks. 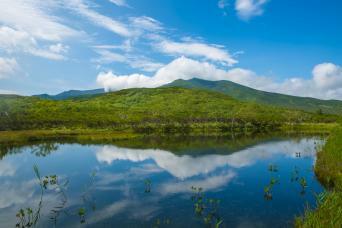 We take exhilirating walks through beautiful scenery in the Oze Wetlands, Mount Gas-san, and the Tono Valley. The Japanese poet Matsuo Basho traveled through this region in the 17th century, a journey subsequently published as The Narrow Road to the Deep North. 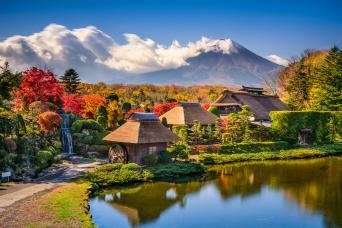 We will visit several of the places which inspired his famous haiku poems. Our small group stays at traditional Ryokan and Minshuku inns in the countryside – always with wonderful service and beautifully-prepared regional cuisine featuring fresh local ingredients. 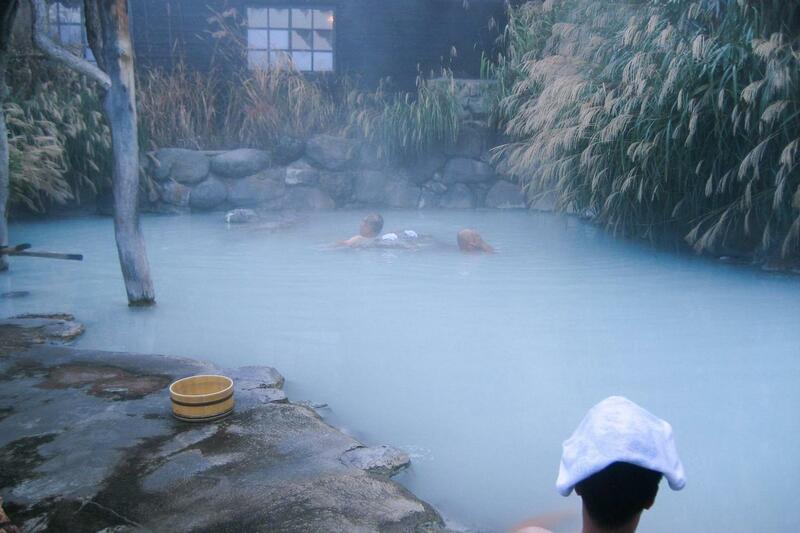 Natural hot-spring baths are highlights of our journey. At Tochio near Oze our hot-spring Ryokan has open-air baths next to a rushing river, while at Nyuto near Lake Tazawako, the 300-year old Tsuru-no-yu Ryokan has eight baths, some with the famous milky-white spring water. The tour begins and ends in Tokyo, with time for sightseeing and shopping. Make this trip your own - one of our scheduled departures can be exclusively for you, your family and your friends. Or choose an alternative date which suits your own personal schedule. Tailor this tour to suit your own interests and schedule. Invite your friends or family on the trip of a lifetime which they'll remember forever. Talk to us and we will craft your dream itinerary. I truly love guiding and sharing the nature and culture of a particular place. I can't wait to share the charms of Japan with visitors! Join us! Tomomi was born and raised in Tokyo. After she finished her degree in international relationships, she studied in the UK and the USA. Later, she lived in Hawaii and Israel and travelled extensively in Europe, the USA and the Middle East. 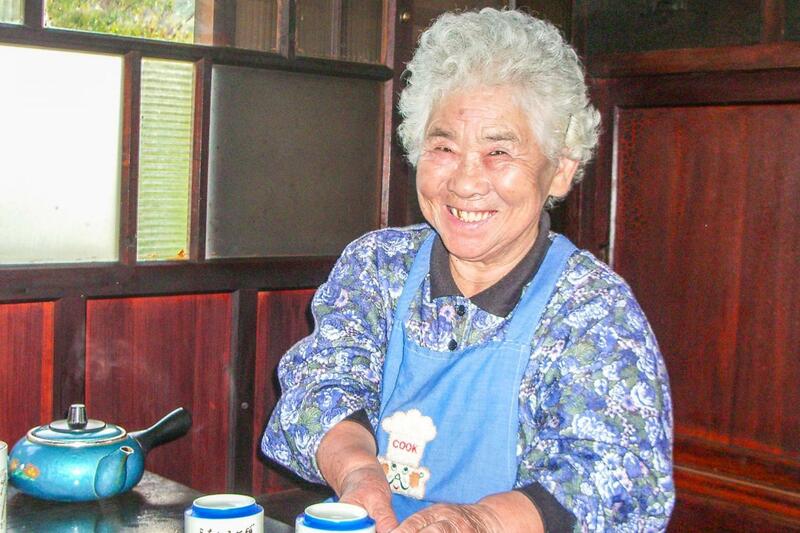 She now lives in Tokyo, close to its centre and loves gardening, walking, cycling and yoga. 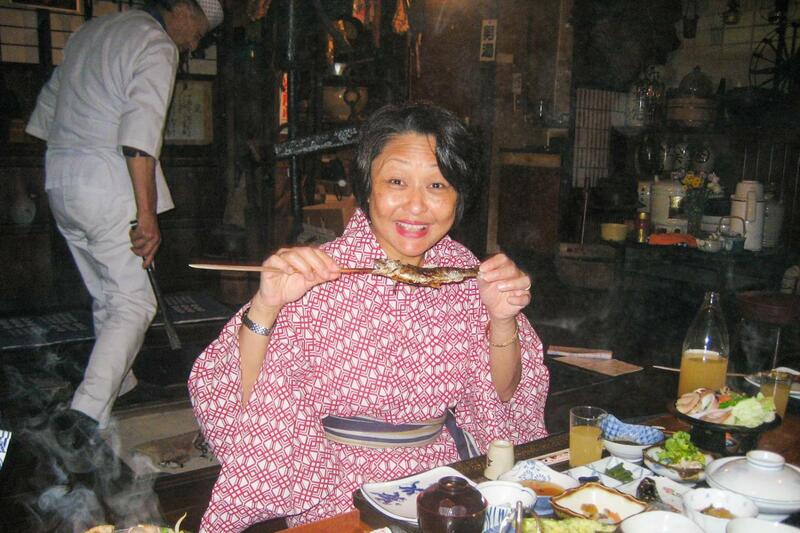 Tomomi enjoys guiding and sharing her knowledge of both traditional and urban Japanese culture. She particularly enjoys exchanging ideas about philosophy and religion. I travelled extensively through Europe and Asia and my passion for different cultures and people inspired me to become a guide. After working for a travel agency for over 6 years as branch manager, Naomi earned her master’s degree in sports tourism and marketing to expand her knowledge of the tourism industry. During her studies, she organized and managed events for international students for cross-cultural exchange. In 2014 she passed the National Tour Guide examination and has since worked as a guide and tour conductor. An expert in Japanese food and Sake, Naomi is interested in Japanese history, culture and sports. Naomi has travelled extensively throughout Europe and Asia. Naomi spends her free time cooking, walking and meditating in Nature. Meet your guide and other group members at the tour hotel in central Tokyo in the evening. There will be a Welcome Dinner at a nearby local restaurant. Our first full day in Japan will be spent on a walking tour of Tokyo. We begin with the historic Yanaka neighbourhood, strolling past small temples, shops, and traditional houses. Continuing to Asakusa, we visit Tokyo’s oldest temple Senso-ji, completed in 645 and approached via the Kaminarimon Gate with its giant red lantern. From Asakusa we board a boat and cruise on the Sumida River to the historic Hamarikyu Garden, with the striking backdrop of gleaming towers in the new Shiodome area. We board a train this morning for the journey out of Tokyo to Nikko, two hours to the north. 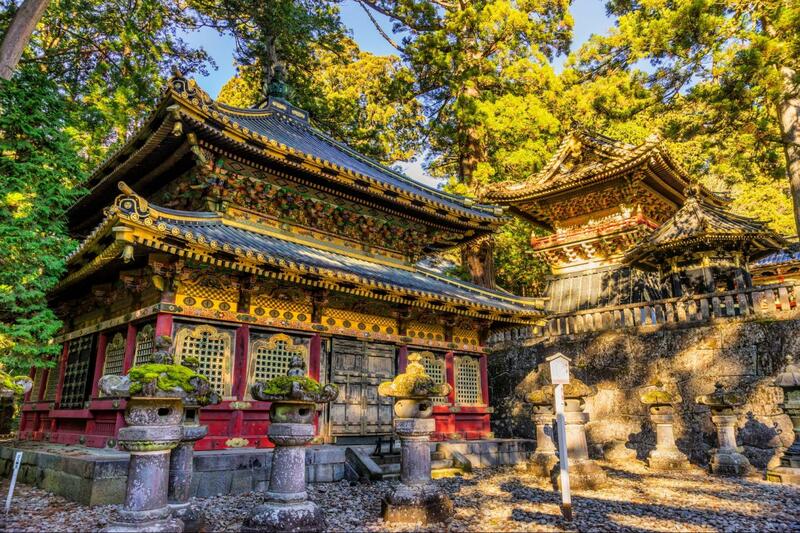 The forests and mountains of Nikko have been sacred to the Japanese for 1,200 years, and it was here that in 1617 the Shogun Tokugawa Ieyasu had himself enshrined at Tosho-gu. These extravagantly ornate buildings are now on the list of UNESCO World Heritage sites and we will take a guided walking tour of the main shrine structures. Afterwards we relax at our inn situated along a small river valley. We enjoy a sumptuous dinner of Japanese food served by the gracious Ryokan staff. We travel for two hours on a series of mountain roads to the start of our walk into Oze Marshland. 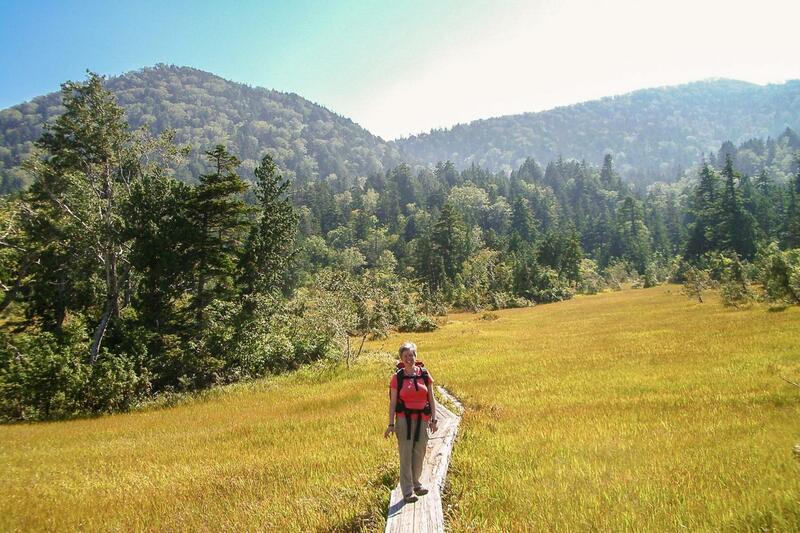 A two-hour hike brings us to the marshland high in the mountains of the Nikko National Park. This beautiful area is a haven for wild flowers and plants. We stay at a friendly mountain lodge next to the Oze-numa lake. After an early breakfast, we hike through the Oze Marshland to the Oze-ga-hara area where boardwalks are laid out amongst the marshes. We continue to the northern edge of the marsh, where a bus will take us through a long valley to Okutadani lake and a boat ride to the opposite side. Another short bus ride will bring us to Tochiomata hot spring, where we stay in a lovely traditional Ryokan, enjoying a dip or two in the open-air hot spring baths. We take a bus to the nearby town of Koide, transferring to the shinkansen (Bullet train) for our continuation north, following the picturesque Japan Sea coast for part of the way. 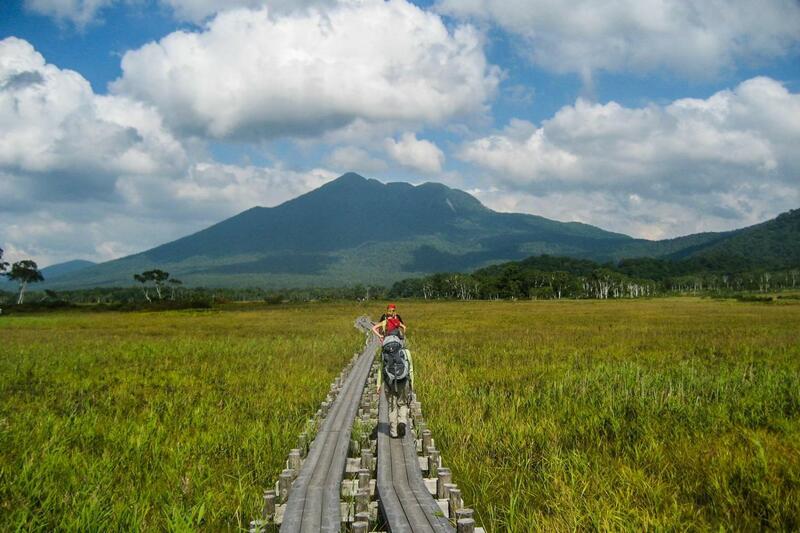 Our destination is Dewa Sanzan (literally ‘three peaks of Dewa’), which refers to the three sacred peaks of Haguro-san, Gas-san, and Yudono-san. The lowest of the three, Haguro-san is spiritual home of the Shugendo sect, a mixture of the native Shinto belief and Buddhism. 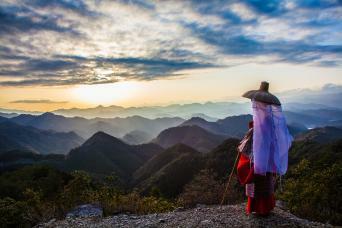 Mountain ascetics known as yamabushi can still be seen with their conch shells, used to call the spirits. We will also visit Gyokusenji temple. Said to have been founded in 1251 by the Zen monk Ryonen Homyo Zenji. We will take a peaceful moment to enjoy the view of the garden while participating in the tea ceremony. From Gyokusenji we will head to a lovely Shukubo (pilgrims lodgings) where we stay tonight. Dinner is a meal of shojin-ryori, vegetarian Buddhist cuisine. A local bus brings us to the start of our hike on Mount Gas-san. 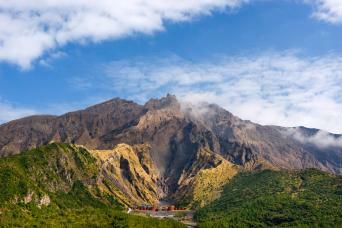 The highest of the three sacred mountains, Gas-san is covered in deep snow for much of the year. The mountain is officially ‘opened’ each year with a ceremony at the Shinto shrine at the summit, which we will reach following a two and half hour climb. Along the hike there are lovely small ponds formed by the melting snow and an abundance of alpine flowers. After a picnic lunch, we will retrace our steps down the mountain and head to the entrance of Haguro-san. 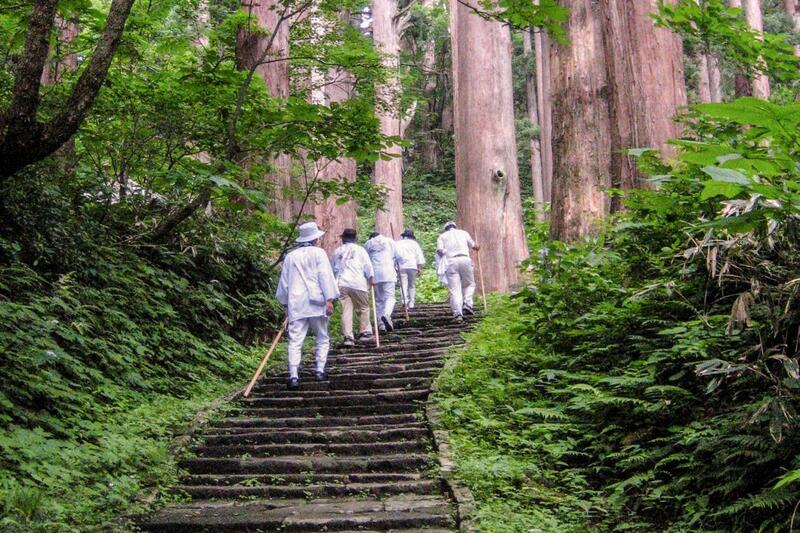 We will walk up a beautiful staircase of 2,446 stone steps through giant cedars to the summit, At the top, pilgrims in their white coats head for the Dewa Sanzan shrine with its massive thatched roof, which we visit before returning to Shukobo lodging for dinner. Following dinner there will be an optional visit to a nearby natural hot spring. This morning we leave the Dewa Sanzan area. 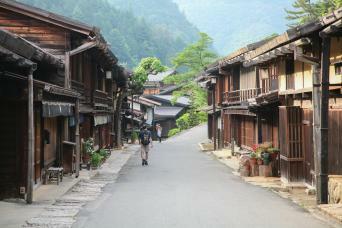 Our first stop is Kakunodate, a former feudal town with well-preserved Samurai residences. We walk through the former Samurai quarter, with an opportunity to visit one of the elegant samurai houses, before arriving at the merchants' area. Lastly we will continue to Nyuto Hot Spring, a hot spring town in which each hot spring has its own unique water source. We check in to our beautiful hot spring ryokan for the night and the evening we will dine around the irori (traditional sunken hearth). 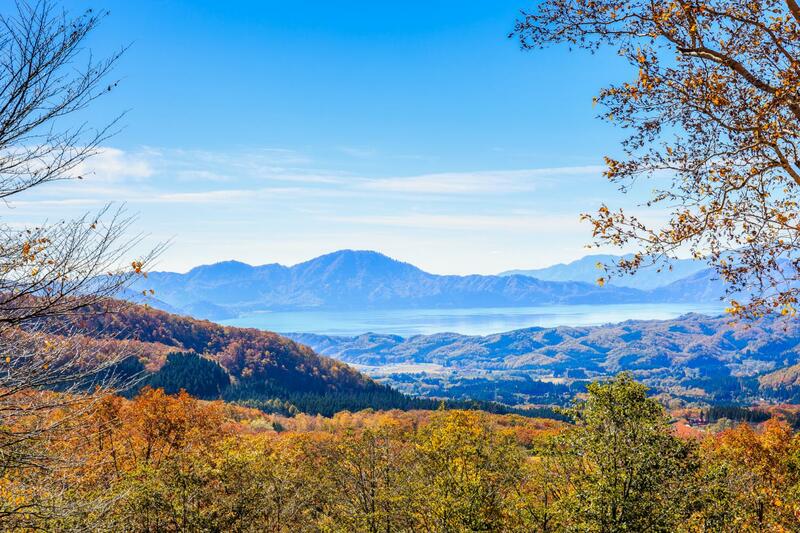 After breakfast, we head off along a path climbing towards Mount Nyuto for spectacular views of the surrounding mountains and Lake Tazawako to the south. The length of the walk and route will be decided locally based on the weather conditions. Those wishing for a more relaxed day can stay and soak in the hot springs, or try some short walks along the valley floor. Today we will travel by road to Tono, famous in Japan for its rich folklore. This rural community set in a broad green valley takes great pride in its folk tales, which feature such characters as the Kappa, child-sized beings that live in or near rivers. The local people have a strong pride in their culture and myths, and have worked hard to preserve them. In the morning, we rent bicycles and cycle slowly along the quiet country lanes of the wide Tono Valley. Depending on the time of year, we may see rice being harvested. After lunch we will take the local train to Shin-Hanamaki and catch the shinkansen Bullet Train back to Tokyo, arriving early evening. There will be a free day today in Tokyo, for shopping, visiting a museum, or simply wandering through the city. In the evening there will be a Farewell Dinner with your guide at a local restaurant. The tour ends today after breakfast. Your guide will be on hand to offer assistance and advice for travelling to the airport if you have homeward flights, or on onward travel if you are extending your stay in Japan.